Image Size: 9" x 6" Framed Size: 14" x 11" Train #8, the Montreal Section of the "Dominion", rolls through the snow-coated landscape of the Bow Valley on its eastward journey. Castle Mountain, aptly named by James Hector in 1858, was renamed Mt. Eisenhower by Prime Minister MacKenzie King. The new name was never popular, and was officially changed back in 1979. Leading the train is the original member of the 5900 series “Selkirk” types. 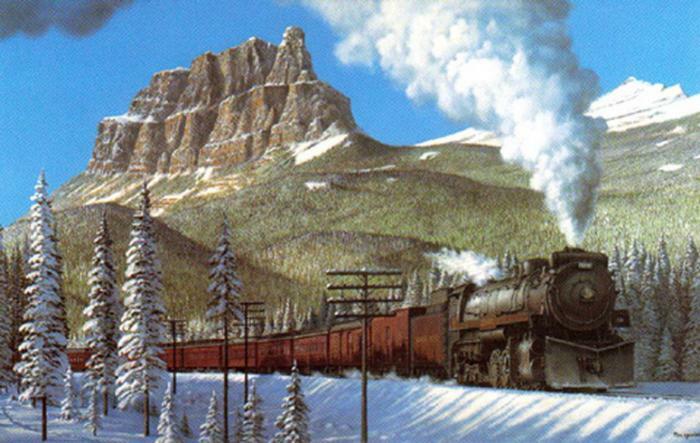 These were Canada’s largest steam locomotives and were built for mainline service in the western mountains.